New Delhi, March 20: Delhi Capitals' pacer Ishant Sharma wants to take wickets than just bowling well in the 12th edition of the Indian Premier League (IPL). The fast bowler, picked for Rs 1.10 crore in the auction, feels this Delhi team has the arsenal to go all out and win the title. The team has the perfect combination of fast and spin bowlers, he said. 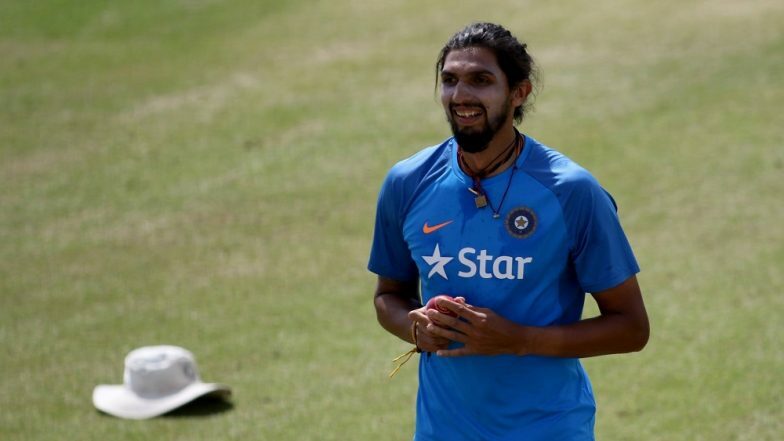 Remarking that he has high ambitions for this season, Ishant said, "I am focused on taking more wickets, not just bowling well. Of course, it (wickets) depends on how well you bowl, but the most important thing is you use your good performance by helping the team in taking important wickets. Sourav Ganguly Joins Delhi Capitals; Starts his Duties as an Advisor Ahead of IPL 2019 (Watch Video). "Delhi Capitals has some great bowling options for IPL 2019. With the likes of Trent Boult and Kagiso Rabada in the team, I think we have one of the best bowling lineups this time. We have some good all-rounders along with great spinners and that shall help in restricting teams from scoring freely," the 30-year-old said. Delhi Capitals Squad in IPL 2019: Team Profile, Schedule of DC in VIVO Indian Premier League 12.